Filmmakers are being asked to create a contemporary way of exploring the past as part of the 2017 Peninsula Arts Film Commission. Successfully launched this year, the second staging of the annual competition will aim to support established, new and emerging artists and curators based in the South West and beyond. They will be challenged to develop ideas around this year’s theme Visions of History, considering or challenging the changing understanding of what history is, who owns it, and how it is reflected in film and television achieves and practices. And the winning entries will be premiered during a special screening in Plymouth University’s Jill Craigie Cinema, held as part of the 2017 Plymouth History Festival. 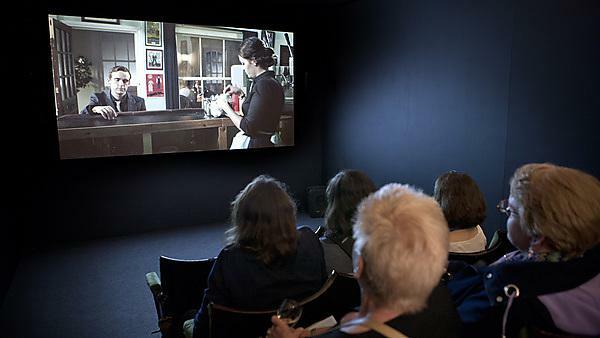 The Peninsula Arts Film Commission is a History Centre partnership project delivered by Peninsula Arts and Plymouth City Museum and Art Gallery, in partnership with the South West Film and Television Archive (SWFTA). Entrants will be asked to make use of SWFTA archive material in producing their ideas, and will be able to compete for two awards – the £3,500 Peninsula Arts Commission Prize, and the £1,500 Peninsula Arts Development Prize. Both categories will be judged by a panel of experts, including representatives from Peninsula Arts and SWFTA, alongside academics and researchers from Plymouth University. The 2016 Peninsula Arts Film Commission was won by James Norton, whose film – RASHER: Landscape Memoirs – was based on a North Devon folktale from The Bradworthy Book. “It was a great honour to be chosen for this commission, and through it I was able to delve into a rich and fascinating archive to thread together fact and fiction, and tell an amazing story of local folklore. The archival clips and footage I used provided a heightened authenticity of such a unique landscape and sense of place." The 2017 Peninsula Arts Film Commission is now open for entries, with the deadline for submissions being midnight on Sunday 27 November. Watch the trailer of James W. Norton's 'RASHER: Landscape Memoirs', Peninsula Arts film commission winner for 2016. Peninsula Arts run the Jill Craigie Cinema at Plymouth University, named after Jill Craigie (1914-1999) who was the British documentary film director, actor, writer and feminist. Drawing on this association, Peninsula Arts is a passionate advocate for film, recognising the mediums ability to entertain and inspire. Past cinema programmes have supported popular, cult classics and artist films, opening up the rich history of cinematography alongside the latest developments in contemporary cinema to a wide range of audiences. It is the supporting organisation for the River Tamar Project, which launched the highly successful It’s All About the River film festival in Sept-Oct 2015 and regularly partners with other independent cinemas and art organisations to promote the diversity and richness of cinema and film. The South West Film and Television Archive (SWFTA) is the official regional film archive for the South West of England. It is the largest regional film archive in the UK, a member of the UK Film Archive Network (FAUK) and is recognised as one of the UK’s most significant screen heritage collections. SWFTA is a partner in the BFIs Film Audience Network (SW and West Midlands Hub) and is a key partner in the Plymouth History Centre project. Through the annual Peninsula Arts film commission awards, SWFTA aims to build a body of work that reflects on Plymouth’s film heritage and looks towards its future.